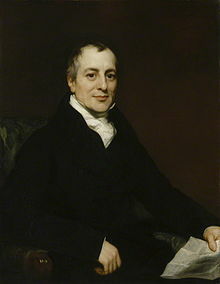 David Ricardo (18 April 1772 – 11 September 1823) was a British political economist, one of the most influential of the classical economists along with Thomas Malthus, Adam Smith and James Mill. Following this estrangement he went into business for himself with the support of Lubbocks and Forster, an eminent banking house. He made the bulk of his fortune as a result of speculation on the outcome of the Battle of Waterloo. The Sunday Times reported in Ricardo's obituary, published on 14 September 1823, that during the Battle of Waterloo Ricardo "netted upwards of a million sterling", a huge sum at the time. He immediately retired, his position on the floor no longer tenable, and subsequently purchased Gatcombe Park, an estate in Gloucestershire, now owned by Princess Anne, the Princess Royal and retired to the country. He was appointed High Sheriff of Gloucestershire for 1818–19. In August 1818 he bought Lord Portarlington's seat in Parliament for £4,000, as part of the terms of a loan of £25,000. His record in Parliament was that of an earnest reformer. He held the seat until his death five years later. Ricardo was a close friend of James Mill. Other notable friends included Jeremy Bentham and Thomas Malthus, with whom Ricardo had a considerable debate (in correspondence) over such things as the role of landowners in a society. He also was a member of Malthus' Political Economy Club, and a member of the King of Clubs. He was one of the original members of The Geological Society. His youngest sister was author Sarah Ricardo-Porter (e.g., Conversations in Arithmetic). His friend John Louis Mallett commented: " … he meets you upon every subject that he has studied with a mind made up, and opinions in the nature of mathematical truths. He spoke of parliamentary reform and ballot as a man who would bring such things about, and destroy the existing system tomorrow, if it were in his power, and without the slightest doubt on the result … It is this very quality of the man’s mind, his entire disregard of experience and practice, which makes me doubtful of his opinions on political economy." Ricardo is buried in an ornate grave in the churchyard of Saint Nicholas in Hardenhuish, now a suburb of Chippenham, Wiltshire. At the time of his death his fortune was estimated at about £600,000. Ricardo became interested in economics after reading Adam Smith's The Wealth of Nations in 1799. He wrote his first economics article at age 37, firstly in The Morning Chronicle advocating reduction in the note-issuing of the Bank of England and then publishing "The High Price of Bullion, a Proof of the Depreciation of Bank Notes" in 1810. He was also an abolitionist, speaking at a meeting of the Court of the East India Company in March 1823, where he said he regarded slavery as a stain on the character of the nation. His sister, Hanna, had married David Samuda (1776–1824) who came from a slave-owning family with a substantial number of slaves in Jamaica. Mr. Malthus appears to think that it is a part of my doctrine, that the cost and value of a thing be the same;—it is, if he means by cost, "cost of production" including profit. Ricardo contributed to the development of theories of rent, wages, and profits. He defined rent as "the difference between the produce obtained by the employment of two equal quantities of capital and labor." Ricardo believed that the process of economic development, which increased land utilization and eventually led to the cultivation of poorer land, principally benefited landowners. According to Ricardo, such premium over "real social value" that is reaped due to ownership constitutes value to an individual but is at best a paper monetary return to "society". The portion of such purely individual benefit that accrues to scarce resources Ricardo labels "rent". Between 1500 and 1750 most economists advocated Mercantilism which promoted the idea of international trade for the purpose of earning bullion by running a trade surplus with other countries. Ricardo challenged the idea that the purpose of trade was merely to accumulate gold or silver. With "comparative advantage" Ricardo argued in favour of industry specialisation and free trade. He suggested that industry specialization combined with free international trade always produces positive results. This theory expanded on the concept of absolute advantage. Ricardo suggested that there is mutual national benefit from trade even if one country is more competitive in every area than its trading counterpart and that a nation should concentrate resources only in industries where it has a comparative advantage, that is in those industries in which it has the greatest competitive edge. Ricardo suggested that national industries which were, in fact, profitable and internationally competitive should be jettisoned in favour of the most competitive industries, the assumption being that subsequent economic growth would more than offset any economic dislocation which would result from closing profitable and competitive national industries. Ricardo attempted to prove theoretically that international trade is always beneficial. Paul Samuelson called the numbers used in Ricardo's example dealing with trade between England and Portugal the "four magic numbers". "In spite of the fact that the Portuguese could produce both cloth and wine with less amount of labor, Ricardo suggested that both countries would benefit from trade with each other". As for recent extensions of Ricardian models, see Ricardian trade theory extensions. Ricardo's theory of international trade was reformulated by John Stuart Mill. The term "comparative advantage" was started by J. S. Mill and his contemporaries. John Stuart Mill started a neoclassical turn of international trade theory, i.e. his formulation was inherited by Alfred Marshall and others and contributed to the resurrection of anti-Ricardian concept of law of supply and demand and induce the arrival neoclassical theory of value. Ricardo's four magic numbers has long been interpreted as comparison of two ratios of labor input coefficients. This interpretation is now considered as erroneous. This point was first pointed by Roy J. Ruffin in 2002 and examined and explained in detail in Andrea Maneschi in 2004. This is now known as new interpretation but it has been mentioned by P. Sraffa in 1930 and by Kenzo Yukizawa in 1974. The new interpretation affords totally new reading of Ricardo's Principles of Political Economy and Taxation with regards to trade theory. Like Adam Smith, Ricardo was an opponent of protectionism for national economies, especially for agriculture. He believed that the British "Corn Laws"—tariffs on agricultural products—ensured that less-productive domestic land would be harvested and rents would be driven up (Case & Fair 1999, pp. 812, 813). Thus, profits would be directed toward landlords and away from the emerging industrial capitalists. Ricardo believed landlords tended to squander their wealth on luxuries, rather than invest. He believed the Corn Laws were leading to the stagnation of the British economy. In 1846, his nephew John Lewis Ricardo, MP for Stoke-upon-Trent, advocated free trade and the repeal of the Corn Laws. it would undoubtedly be advantageous to the capitalists [and consumers] of England… [that] the wine and cloth should both be made in Portugal [and that] the capital and labour of England employed in making cloth should be removed to Portugal for that purpose. Ricardo recognized that applying his theory in situations where capital was mobile would result in offshoring, and therefore economic decline and job loss. To correct for this, he argued that (i) most men of property [will be] satisfied with a low rate of profits in their own country, rather than seek[ing] a more advantageous employment for their wealth in foreign nations, and (ii) that capital was functionally immobile. Ricardo's argument in favour of free trade has also been attacked by those who believe trade restriction can be necessary for the economic development of a nation. Utsa Patnaik claims that Ricardian theory of international trade contains a logical fallacy. Ricardo assumed that in both countries two goods are producible and actually are produced, but developed and underdeveloped countries often trade those goods which are not producible in their own country. In these cases, one cannot define which country has comparative advantage. As Joan Robinson pointed out, following the opening of free trade with England, Portugal endured centuries of economic underdevelopment: "the imposition of free trade on Portugal killed off a promising textile industry and left her with a slow-growing export market for wine, while for England, exports of cotton cloth led to accumulation, mechanisation and the whole spiralling growth of the industrial revolution". Robinson argued that Ricardo's example required that economies were in static equilibrium positions with full employment and that there could not be a trade deficit or a trade surplus. These conditions, she wrote, were not relevant to the real world. She also argued that Ricardo's math did not take into account that some countries may be at different levels of development and that this raised the prospect of 'unequal exchange' which might hamper a country's development, as we saw in the case of Portugal. Another idea associated with Ricardo is Ricardian equivalence, an argument suggesting that in some circumstances a government's choice of how to pay for its spending (i.e., whether to use tax revenue or issue debt and run a deficit) might have no effect on the economy. This is due to the fact the public saves its excess money to pay for expected future tax increases that will be used to pay off the debt. Ricardo notes that the proposition is theoretically implied in the presence of intertemporal optimisation by rational tax-payers: but that since tax-payers do not act so rationally, the proposition fails to be true in practice. Thus, while the proposition bears his name, he does not seem to have believed it. Economist Robert Barro is responsible for its modern prominence. ^ Sowell, Thomas (2006). On classical economics. New Haven, CT: Yale University Press. ^ a b Heertje, Arnold (2004). "The Dutch and Portuguese-Jewish background of David Ricardo". European Journal of the History of Economic Thought. 11 (2): 281–94. doi:10.1080/0967256042000209288. ^ Ricardo, David. 1919. Principles of Political Economy and Taxation. G. Bell, p. lix: "by reason of a religious difference with his father, to adopt a position of independence at a time when he should have been undergoing that academic training"
^ "No. 17326". The London Gazette. 24 January 1818. p. 188. ^ "RICARDO, David (1772–1823), of Gatcombe Park, Minchinhampton, Glos. and 56 Upper Brook Street, Grosvenor Square, Mdx". History of Parliament Online. Retrieved 18 September 2013. ^ Hayek, Friedrich (1991). "The Restriction Period, 1797-1821, and the Bullion Debate". The Trend of Economic Thinking. pp. 199–200. ISBN 978-0865977426. ^ Okker, Rudolph. "Re: Samuda". Gen Forum. Retrieved 11 September 2014. ^ Ricardo, David (1817) On the Principles of Political Economy and Taxation. Piero Sraffa (Ed.) Works and Correspondence of David Ricardo, Volume I, Cambridge University Press, 1951, p. 11. ^ Ricardo, David (1817) On the Principles of Political Economy and Taxation. Piero Sraffa (Ed.) Works and Correspondence of David Ricardo, Volume I, Cambridge University Press, 1951, p. 47. ^ On The Principles of Political Economy and Taxation London: John Murray, Albemarle-Street, by David Ricardo, 1817 (third edition 1821) – Chapter 6, On Profits: paragraph 28, "Thus, taking the former . . ." and paragraph 33, "There can, however...."
^ Ricardo, David (1817) On the Principles of Political Economy and Taxation. Piero Sraffa (Ed.) Works and Correspondence of David Ricardo, Volume I, Cambridge University Press, 1951, p. 135. ^ Samuelson, Paul A. (1972), "The Way of an Economist." Reprinted in The Collected Papers of Paul A. Samuelson. Ed. R. C. Merton. Cambridge: Cambridge MIT Press. p. 378. ^ Mill, J. S. (1844) Essays on some unsettled questions of political economy. London, John W. Parker; Mill, J. S. (1848) The principles of political economy. (vol. I and II) Boston: C.C.Little & J. Brown. ^ Shiozawa, Y. (2017) An Origin of the Neoclassicla Revolutions: Mill's "Reversion" and its consequences. In Shiozawa, Oka,and Tabuchi (eds.) A New Construction of Ricardian Theory of International Values, Tokyo: Springer Japan, Chapter 7 pp.191-243. ^ Ruffin, R.J. (2002) David Ricardo's discovery of comparative advantage. History of Political Economy 34(4): 727-748. ^ Maneschi, A. (2004) The true meaning of David Ricardo's fur magic numbers. Journal of International Economics 62(2): 433-443. ^ Tabuchi, T. (2017) Yukizawa's interpretation of Ricardo's `theory of comparative cost`. In Senga, Fujimoto, and Tabuchi (Eds.) Ricardo and International Trade, London and New York; Routledge, Chapter 4, pp.48-59. ^ Faccarello, G. (2017) A calm investigation into Mr. Ricardo's principle of international trade. In Senga, Fujimoto, and Tabuchi (Eds.) Ricardo and International Trade, London and New York; Routledge. Tabuchi, T. (2017) Comparative Advantage in the Light of the Old Value Theories. In Shiozawa, Oka,and Tabuchi (eds.) A New Construction of Ricardian Theory of International Values, Tokyo: Springer Japan, Chapter 9 pp.265-280. ^ Williamson, J. G. (1990). "The impact of the Corn Laws just prior to repeal". Explorations in Economic History. 27 (2): 123. doi:10.1016/0014-4983(90)90007-L.
^ a b Ricardo, David (1821). On the Principles of Political Economy and Taxation. John Murray. p. 7.19. ^ Patnaik, Uta (2005). "Ricardo's Fallacy/ Mutual Benefit from Trade Based on Comparative Costs and Specialization?". In Jomo, K. S. (ed.). The Pioneers of Development Economics: Great Economists on Development. London and New York: Zed books. pp. 31–41. ISBN 81-85229-99-6. ^ Robinson, Joan (1979). Aspects of Development and Underdevelopment. Cambridge: Cambridge University Press. p. 103. ISBN 0521226376. ^ Chang, Ha-Joon (2007), "Bad Samaritans", Chapter 2, pp. 30–31. ^ Davis, William L., Bob Figgins, David Hedengren, and Daniel B. Klein. "Economics Professors' Favorite Economic Thinkers, Journals and Blogs (along with Party and Policy Views)," Econ Journal Watch 8(2): 126–46, May 2011 . ^ Schumpeter, History of Economic Analysis, (published posthumously, ed. Elisabeth Boody Schumpeter), 1954. pp. 569, 1171. Schumpeter also criticized J. M. Keynes for committing the same Ricardian vice. ^ Landreth Colander 1989 History of Economic Thought Second Edition, p.137. ^ George, Henry, Progress and Poverty. Preface to the 4th Edition, November 1880. ^ Piero Sraffa and M.H. Dobb, editors (1951–1973). 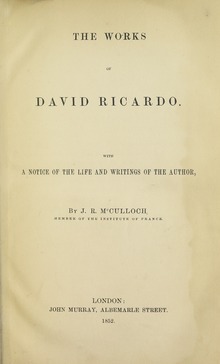 The Works and Correspondence of David Ricardo. Cambridge University Press, 11 volumes. ^ Sraffa, Piero 1960, Production of Commodities by Means of Commodities: Prelude to a Critique of Economic Theory. Cambridge University Press. ^ Steedman, Ian, ed. (1979). Fundamental Issues in Trade Theory. London: MacMillan. ISBN 0-333-25834-7. ^ Steedman, Ian (1979). Trade Amongst Growing Economies. Cambridge, UK: Cambridge University Press. pp. &#91, page&nbsp, needed&#93, . ISBN 0-521-22671-6. ^ Edwards, Chris (1985). "§ 3.2　The 'Sraffian' Approach to Trade Theory". The Fragmented World: Competing Perspectives on Trade, Money, and Crisis. London and New York: Methuen & Co. pp. 48–51. ISBN 0-416-73390-5. ^ Christophe Depoortère, Joël Thomas Ravix 2015 The classical theory of international trade after Sraffa. Cahiers d'économie Politique / Papers in Political Economy (69): 203–34, February 2015. ^ Matsuyama, K. (2000), "A Ricardian Model with a Continuum of Goods under Nonhomothetic Preferences: Demand Complementarities, Income Distribution, and North–South Trade" (PDF), Journal of Political Economy, 108 (6): 1093–120, doi:10.1086/317684. ^ Shiozawa, Y. (2007). "A New Construction of Ricardian Trade Theory: A Multi-country, Multi-commodity Case with Intermediate Goods and Choice of Production Techniques". Evolutionary and Institutional Economics Review. 3 (2): 141–87. doi:10.14441/eier.3.141. ^ Y. Shiozawa (2017) The new theory of international values: An overview. Shiozawa, Oka and Tabuchi (eds.) A New Construction of Ricardian Theory of International Values. Singapore: Springer. Chapter 1, pp.3-73. ^ Yeats, A. (2001). "Just How Big is Global Production Sharing?". In Arndt, S.; Kierzkowski, H. (eds.). Fragmentation: New Production Patterns in the World Economy. Oxford: Oxford University Press. ISBN 0-19-924331-X. ^ Chris Edwards 1985 The Fragmented World: Competing Perspectives on Trade, Money and Crisis, London and New York: Methuen. Chapter 4.